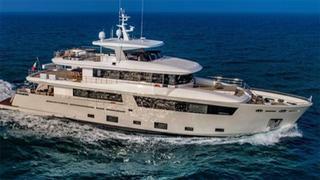 Italian yard Cantiere delle Marche has revealed that the fifth hull in its Nauta Air 110 series, Mimi la Sardine, has completed her delivery sea trials. 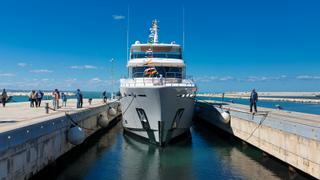 The news comes after the 33.5 metre steel and aluminium explorer yacht was launched in October this year. Described by the yard as "definitely the most contemporary interpretation of explorer yacht design", Mimi la Sardine features exterior and interior design by Mario Pedol and Massimo Gino of Nauta Yachts and naval architecture and engineering by Hydro Tec. The three-decked yacht also features a sun deck and has multiple social areas, including a main saloon and upper saloon equipped with a formal dining area. The tender meanwhile is stored on the upper deck aft. When launched, the area can convert into an open-air lounge area shaded by the sun deck. Key interior materials include natural and weathered oakwood on all decks, Bianco Galizia granite in all bathrooms, Flexform sofas in the main saloon and a Riva1920 timber dining table in the upper deck saloon. Loose furniture, such as sofas, coffee tables and lamps, come from a variety of Italian brands including B&B, Baxter and Flexform. The interior also features large windows and stern terraces. Filippo Bevilacqua of CdM’s interior design department previously revealed that the owner created a Pinterest board to share interior design ideas. “We started sharing ideas and receiving incredibly precise inputs. It has been a pleasure working like this and surely another step ahead for everybody both at Nauta and CdM indeed,” he said. Accommodation is for 12 guests across four lower deck guest cabins and an owners’ apartment on the main deck. Three crew cabins meanwhile allow for a staff of six. Power comes from a pair of Cat18 Acert 533kW engines for a top speed of 13.5 knots and range of 5.500 nautical miles at nine knots.